OAKLAND, Md. – Dan Boone has no doubt that his crusade against wind energy is the right way to protect the Allegheny highlands he loves. Let other environmentalists call him deluded at best, traitorous at worst. He remains undeterred. For four years or more, Mr. Boone has traveled across the mid-Atlantic to make every argument he can muster against local wind-power projects: they kill birds and bats; they are too noisy; they are inefficient, making no more than a symbolic contribution to energy needs. Wind farms on the empty prairies of North Dakota? Fine. 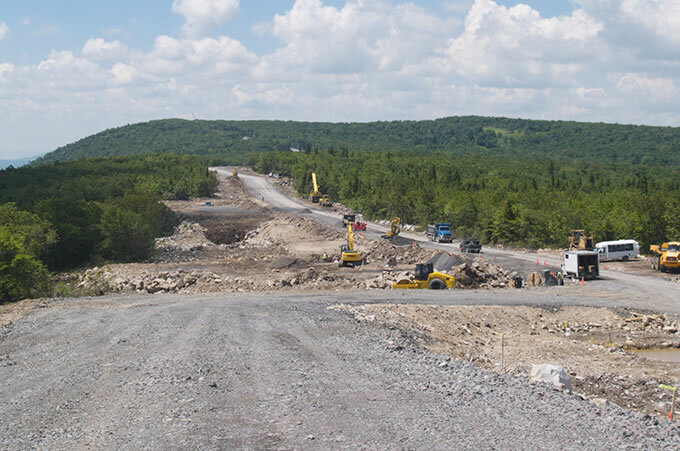 But not, Mr. Boone insists, in the mountainous terrain of southwestern Pennsylvania, western Maryland or West Virginia, areas where 15 new projects have been proposed. If all were built, 750 to 1,000 giant turbines would line the hilltops, most producing, on average, enough electricity to power 600 homes. Wind projects are in the midst of a huge growth spurt in many parts of the country, driven by government incentives to promote alternatives to fossil fuels. But Mr. Boone, who wields a botanist’s trowel and a debater’s knife with equal ease, wants to slow them down with community activism, regulatory action and legal challenges. His crusade harks back to the campaigns against nuclear power plants, toxic-waste dumps and dams on scenic rivers that were building blocks of the modern environmental movement. But the times, and the climate, are changing. With fears of global warming growing more acute, Mr. Boone and many other local activists are finding themselves increasingly out of step with the priorities of the broader movement. National groups like Greenpeace and the Sierra Club used to uniting against specific projects are now united for renewable energy in general. And they are particularly high on wind power – with the caveat that a few, but only a few, special places should be turbine-free. Indeed, the best winds, especially in the East, tend to blow in places that are also ideal for hiking, sailing, second homes and spirit-soothing views. These include the Green Mountains, the Adirondacks, the Chesapeake Bay, Cape Cod and the ridges of northern Appalachia. Local opposition to unwanted development remains a potent force. So when it comes to wind, the environmental movement is riven with dissonance and accusations of elitism. Robert F. Kennedy Jr.’s very public opposition to the 130-turbine Cape Wind energy facility proposed off Nantucket Sound has driven a wedge between activists. Dan Boone’s circuit riding against wind projects, while not attracting the same celebrity notice, has exasperated many Sierra Club compatriots even more. Like Mr. Kennedy, Mr. Boone says the areas he wants to protect are uniquely vulnerable. His family owns property near the proposed projects, just as Mr. Kennedy’s does near the Cape Wind site. But Mr. Boone says that wind supporters are the ones pursuing their own agenda at the expense of the public interest. National environmental leaders reject this argument. The Alleghenies are a big backyard, with views that are both spectacular and problematic. Flowering shrubs like shadbush and preening flowers like trillium are framed by oaks, maples and longleaf pines. But intermittent industrial tree farming has repeatedly denuded some mountainsides. On both sides of the border near here in far western Maryland, second-home development is booming. The air has often been fouled by the Mount Storm coal-fired power plant. If Ned Power, a wind-energy development company, puts up 100 or so turbines along 14 miles of ridgeline near Mount Storm, wind-energy supporters say, how much does that further spoil the landscape? Kevin Rackstraw, a regional manager of Clipper Windpower whose proposed 40-turbine project in western Maryland has drawn Mr. Boone’s fire, said opponents lacked perspective. The Ned Power project is just one target of Mr. Boone, 49, a former state wildlife biologist who now works as a consultant. In interviews, he said he first focused on the issue when working as a botanist on a study related to an early wind power project. The environmental-impact statements, he said, were grossly inadequate. Now he drives from Highland County in western Virginia (where 38 turbines are proposed on Tamarack Ridge) to Bedford, Pa. (where early discussions of an unnamed project are under way) to talk to local groups or crystallize their objections for them. In Annapolis, Md., and Charleston, W.Va., he uses state utility regulators’ licensing hearings to throw up roadblocks before wind projects. He is eager to argue with industry officials in any venue, questioning their facts, assumptions and motives. Mr. Boone’s quiver of anti-wind arguments includes economic analyses, but his first line of attack is biological: he contends that they are a threat to bats and potentially to migratory birds and that they break up forest habitat. Scores of raptors and other birds were killed by the first generation of wind turbines set up at Altamont Pass in Northern California. Since the Altamont Pass turbines were erected in the early 1980’s, turbine design has been altered, and most subsequent studies have shown that birds tend to fly above the height of most turbines though some experts say more studies are needed. 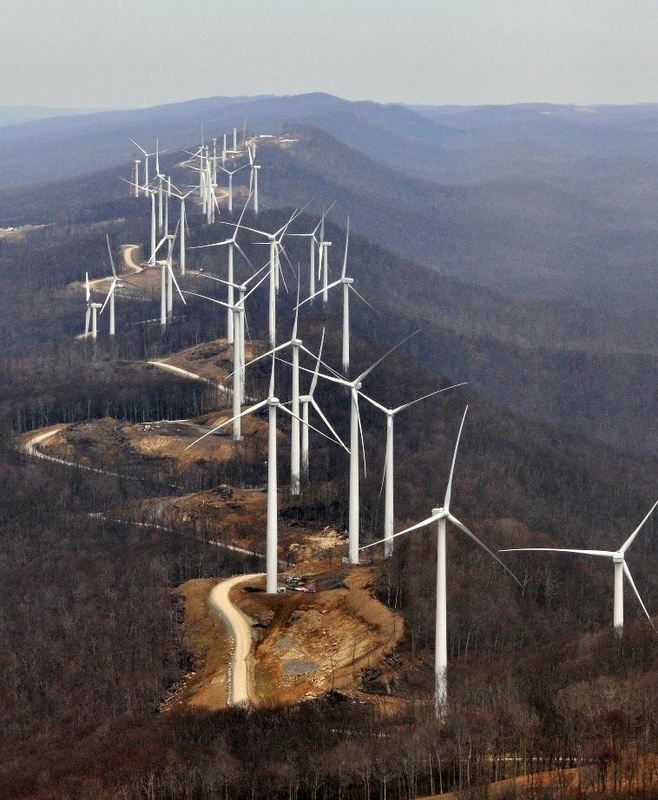 But the turbines south of here in Thomas, W.Va., have been lethal to bats. 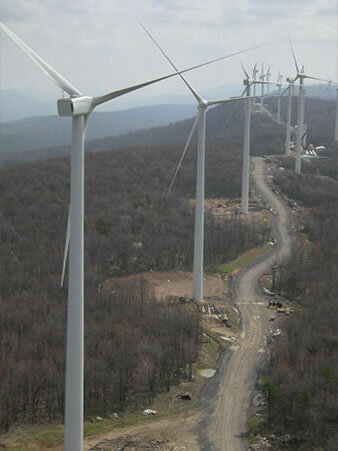 More than 2,000 were killed in 2003 at the Mountaineer project, whose 44 turbines are owned by FPL Energy, a big power company that is the wind industry’s dominant player. Industry officials agree that the bat mortality measured at the Mountaineer site is unacceptable, and they are studying the benefits of deterrent devices and the best ways to modify turbine operations in bat-rich areas. The industry Mr. Boone regards so suspiciously is on a roll. 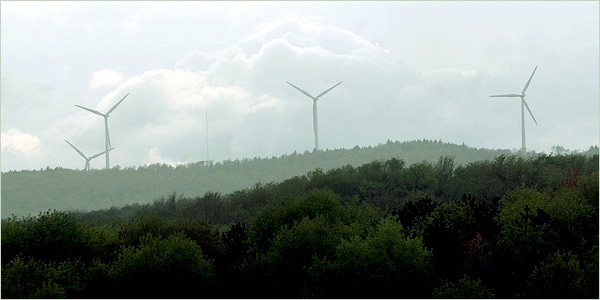 The total share of energy that wind farms generated nationwide in 2004 was tiny – about one-third of 1 percent, according to the Energy Department. But by 2020, according to industry estimates, wind’s share of the county’s energy portfolio could grow ten- or twentyfold. For the environmental movement, wind supporters say, the transition from the protection of place to the protection of planet is bound to be wrenching.